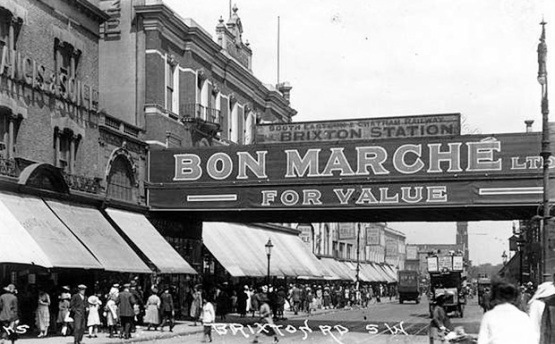 News and listings site Brixton Buzz has released an intriguing photo blog about Bon Marche: the department store in Brixton. Bon Marche opened in the area in 1877 - and was founded by Mr James Smith, a printer and publisher in Tooting. Smith won a fortune at Newmarket and invested the proceeds in commerce - and voila: Bon Marche was born! Initially modelled on the original store in Paris, it cost £70,000 to open and was a huge deal in Brixton, attracting thousands of shoppers to the town. The store became a public company and fashion departments, a tea room and an arcade were added in 1908. By 1924, there were 48 departments and there was even a soda fountain. By 1926, the company was bought by Gordon Selfridge and in the 1940s became part of the John Lewis Partnership, along with the other Selfridge Provincial Stores. Bon Marche closed in 1975 - but the building remains and the name of the store is clear for all to see.